Samsung’s entry into the online-exclusive domain of the Indian smartphone market began with the Galaxy M10 and the Galaxy M20, both of which have received a positive response as per Samsung’s own statements. Carrying forward this momentum, the South Korean electronics giant has today launched the Galaxy M30, a new addition to the Galaxy M-series portfolio, which offers triple rear cameras, fast charging, and a large battery at a competitive price point of Rs. 14,990. We managed to get a brief hands-on experience with Samsung’s latest smartphone, and here are our first impressions. The Samsung Galaxy M30 flaunts a gradient design on its rear panel and comes in two colour options – Gradation Black and Gradation Blue. Unlike the gradient textures that we have come across on smartphones such as the Honor 10 and the Huawei Nova 3, the Samsung Galaxy M30’s finish does not change colours when light falls on it from different angles. The rear panel has an understated elegance to it, but it attracts smudges easily. The vertically aligned triple rear camera setup sits almost flush with the rear panel, while the fingerprint sensor is placed beside it. The right edge hosts the power and volume buttons, which provide nice clicky feedback. The left edge of the Samsung Galaxy M30 houses the SIM tray (Nano + Nano) with a dedicated microSD card slot, while the bottom edge features the speaker, USB Type-C port, and 3.5mm headphone jack. The Galaxy M30’s build quality feels solid, and for a smartphone packing a 5,000mAh battery, it is surprisingly light and easy to handle. 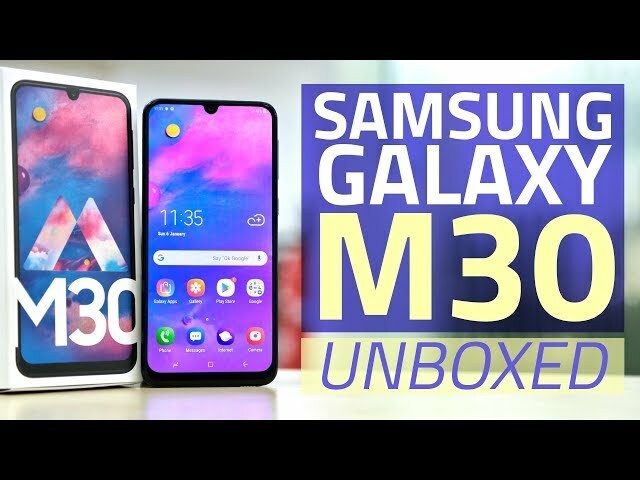 As for the hardware under the hood, the Samsung Galaxy M30 is powered by the same octa-core Exynos 7904 processor as the Galaxy M20, and comes in two configurations — 4GB of RAM with 64GB of storage, and 6GB of RAM with 128GB of storage. You have the option to expand storage using a microSD card (up to 512GB). In the imaging department, the Galaxy M30 packs a triple rear camera set-up with a 13-megapixel primary sensor, a 5-megapixel depth sensor, and a 5-megapixel wide angle camera. On the front, a 16- megapixel camera handles selfies. The front of the Samsung Galaxy M30 is dominated by the 6.4-inch Super AMOLED full-HD+ display flaunting the Infinity-U design with a small notch at the top and a thick chin at the bottom. The display is vibrant and is quite bright, with wide viewing angles, something that is typical of a Super AMOLED panel. 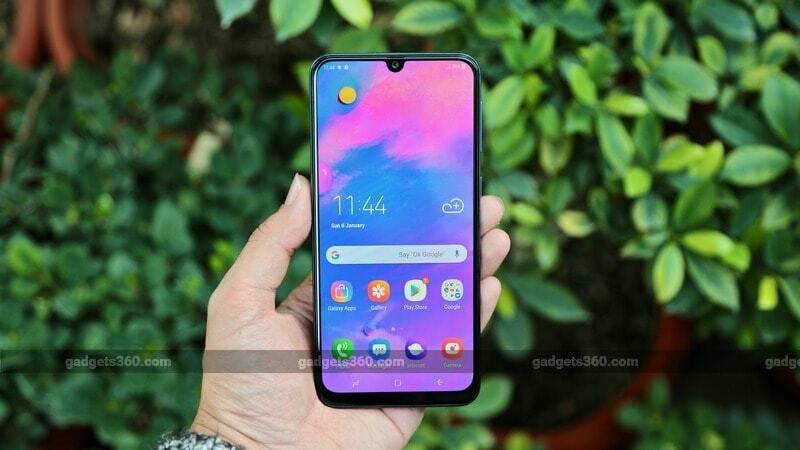 The Samsung Galaxy M30 features Widewine L1 certification, which means that users can stream HD content from services like Netflix. On the software side, the Galaxy M30 will ship with Samsung Experience v9.5 based on Android 8.1 Oreo, but Samsung has promised to release an Android Pie update soon. The Samsung Galaxy M30 packs a large 5,000mAh battery that also supports fast charging, courtesy of the bundled 15W charger. In our brief hands-on experience, we found the new smartphone to be snappy, and it could be quite an attractive offering in its price bracket. We’ll reserve our verdict for the in-depth review, coming up soon, in which we’ll thoroughly assess the Galaxy M30’s performance, battery life, camera quality, and other important parameters.